Keyo is a great tasting chocolate food, which can be used as a sole source of nutrition or as a supplement for the ketogenic diet. 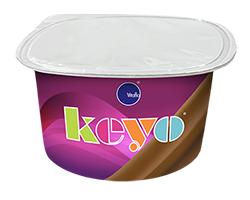 Keyo can be consumed directly from the pot; great chilled or can be frozen for a few hours to make a delicious ketogenic chocolate ice cream. Keyo can also be gently heated to make a lovely chocolate sauce. Each pot contains 30g of fat, 8g protein and 2g of carbohydrate and a great source of micronutrients. Keyo is for children, from 3 years of age, and adults that have been initiated on a ketogenic diet. Why has keyo been recommended? Keyo has been recommendedto help you or your child follow the ketogenic diet. How much keyo will be required? The ketogenic diet is individual to everyone. Your ketogenic team will advise you on how much and how frequently keyo should be consumed within a day, to suit your individual needs. Alternatively you can use keyo in recipes for meals, snacks and drinks. Click on the recipe option below this section to try the recipes, or click the video tab and view how simple keyo is to incorporate into simple dishes or to try something a little more creative.